Muvattupuzha to Bangalore on Kerala Lines! The office function was scheduled for afternoon. I was not sure where would the program end. I did not want to risk returning home and taking a bus. Flights were priced out. A quick look at RedBus, and I narrowed down on options. The sole KSRTC (Kerala) bus on the route was timed a little early for me. After a lot of searching around, I messaged my friend - and he replied back with the confirmation. I and two of my colleagues were travelling together. So, Kerala Lines it was. 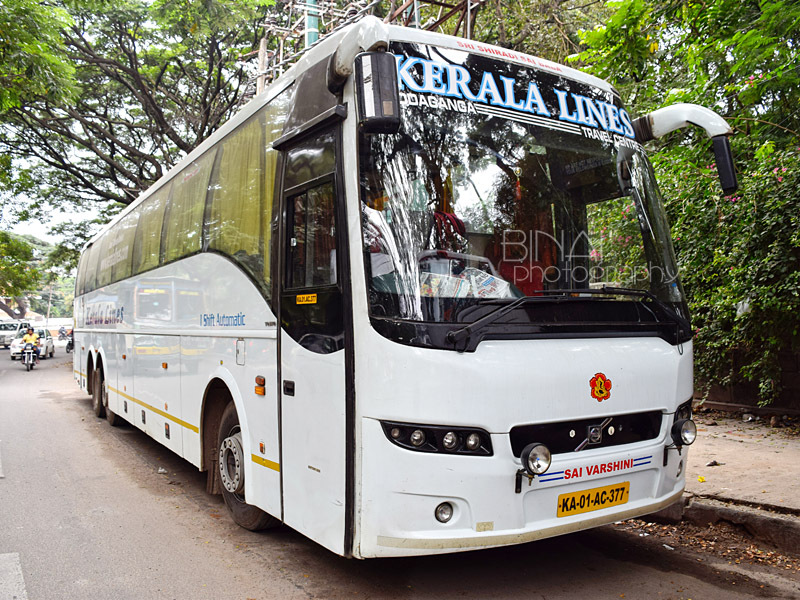 This was an Adoor-Bengaluru service, that operates via Kottayam, Muvattupuzha, Angamaly. Since the function was near Muvattupuzha, I opted for a pick-up at Muvattupuzha. This trip had another unique and interesting fact - this was my 100th ride in a Multi-axle bus as a revenue passenger! My friend messaged me the number of Kerala Lines' office in Thrissur and confirmed the location of my pick-up sometime in the afternoon. We got to Muvattupuzha sometime around 7pm, after successfully completing the event. We had some miscellaneous work around the town, and after finishing all the work, we reached at the pick-up point by 8pm. Since all of us were terribly tired and badly wanted to rest, we decided to have our dinner before boarding the bus. I called up the Kerala Lines office in Thrissur and picked up the driver's number and called him - I was told the bus was still over half-an-hour away. We headed to a restaurant nearby to have a light dinner. We remained in the hotel until around 2030hrs before moving back to the pick-up point. We remained on the road side itself and did not go to the travel agency which was the scheduled pick-up point. The bus turned up around 2049hrs - about 49 minutes late. We got into the bus soon - another 2-3 passengers more got in. We finally started off at 2055hrs. The loads seemed quite healthy for a weekday - that too towards Bangalore. The first impression - the bus was fairly well maintained. I did not hear any rattles or unusual noises. The driving style was not great though. A malayalam movie was being played in the bus - and most passengers seemed to be glued to the movie. We stopped at Perumbavoor for pick-up - at two different agencies, and finally left from there at 2128hrs. The bus was more or less full now. We picked up one more passenger at Kalady, a little later at 2139hrs. The driver seemed to be braking a little too hard every time. We passed Angamaly at 2148hrs - there were no pickups here. I was expecting the bus to pull up for dinner anytime soon. We just passed Hotel Richu's - the driver slammed the brake quite hard to end the service road and then backed to the hotel's parking (2154hrs). Since we had our dinner earlier, we thought to remaining inside the bus - but the AC was switched off, but the engine was left running. I had a look at the cabin a while later - the bus had clocked a little over 6.4 lakh kilometres. The engine sounded a little different outside. The driver finished his dinner quite fast and was back in the bus finishing accounts. He tallied all the cash that he received from different agencies and was cross-checking with the statement given to him. 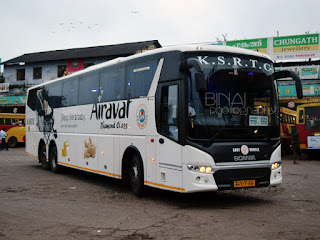 Soon later, Kerala Lines' Scania 13.7m from Pathanamthitta joined us at the hotel. That bus also seemed to have good loads. We started from the hotel at 2222hrs. The driver now had a lot of work to do to get us to Bangalore at the scheduled time. His driving seemed quite unstable - picks up pace very fast, brakes hard very often, makes rash cuts and lane changes. I was too tired to analyse the driving, and slipped asleep by the time we reached Paliekara toll (I remember seeing the toll due to the severe lights entering the cabin at the toll gate). I had a long sleep - I woke up a few times when the bus stopped or the driver braked hard. I vaguely remember seeing us pass Krishnagiri toll. We passed Hosur at 0602hrs. We stopped at the border at 0607hrs to drop a passenger. The driving got a little stable once we passed into Karnataka. There was slow moving traffic around Attibele checkpost due to an accident on the opposite lane. We reached Electronic City at around 0630 - only one toll booth was functional, leading to a slow moving queue. Two FASTag gates were open - which was manually being used to allow vehicles with "day passes" to go through. We dropped passengers after the toll gate and headed towards the city by around 0632. In line with my usual practices, I booked a cab soon after we passed Singasandra. I was finally dropped at Silk board by 0640hrs. Baggage left in the luggage hold were all mixed up - the attendant helped out passengers with their baggage. I bid bye to my colleagues who were travel towards the city and headed out in search of my cab. I was quite shocked to see auto drivers offering passengers to a meter-fare ride! Until a year-or-so ago, one had to bargain with these pirates who would do pull out every trick under their hat to skim you. Short rides costed no less than a couple of hundred rupees. The cab ride home cost me only Rs. 99 - it used to cost no less than Rs. 250 when hiring autos until last year. Remarks: The bus, KA-01-AC-0377 was quite well maintained. It had clocked about 6.4 lakh kms and still looked quite young. The bus was clean inside out - and it smelled fresh. The AC vents were misaligned (the bus was converted from a 53 seater to a 49 seater) - ending up pumping cold air on my head, from the back, than on my face. 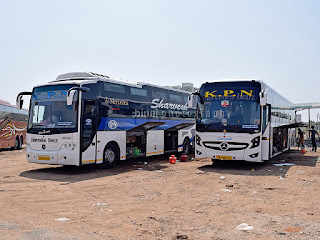 This is was an iShift Volvo B9R - I was traveling in one after a long time. The gear shifts felt better than what I experienced in the KPN Scania on the inbound trip. The bus downshifted less often as well. The driving was quite uncomfortable - hard brakes, rash cuts and unstable lane changes punctuated the ride - I have been informed that the driver is no meore on their rolls, as I type this. We were late at both ends - I felt the delay at Bangalore could've been reduced if not for too may breaks during the night. Overall a no-nonsense service, that has a lot of regular passengers. Will I take this service again? Although I don't travel in that route often, I'll surely give them a chance again! Recommended! 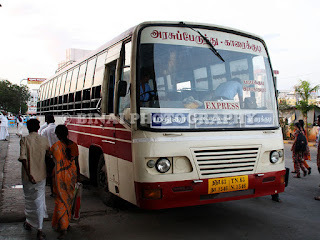 First of all, congrats on your 100th Multi-Axle ride, it is indeed a great achievement for bus-fans like us. Overall, how many times you have travelled in Volvos, Benz and Scanias (including single axle too)? Regarding the change in mentality of auto drivers, it seems that now they have also realised the need of the hour for their survival and is focusing on so called "customer satisfaction" rather than filling their pockets with exorbitant rates!